Thermage for skin tightening has been one of the most successful and reliable treatments offered at SkinCare Physicians for many years. Our dermatologists are able to predictably tighten skin of the face, jawline and neck in an easy, comfortable one hour procedure. Even skin of the abdomen can be tightened and smoothed! Now Thermage has become even better with the introduction of the brand new Thermage FLX machine. SkinCare Physicians is one of the first two practices in the United States to have this exciting new cutting-edge technology, which builds on the success we have had with Thermage since 1999 when our physicians performed the first Thermage procedure in the world. We have continued to improve results and the patient experience for nearly two decades, and Thermage FLX brings exciting new capabilities to us. Thermage FLX dramatically shortens the procedure time to 35 minutes, improves patient comfort with remarkable technology advances, and significantly enhances results. Several of the initial FLX patients commented that they looked smoother and tighter almost immediately after treatment. Jawline skin looks snugger, the cheeks look smoother, and skin of the upper neck becomes more shapely. One of the most exciting aspects of Thermage FLX is the preventive benefit. Since Thermage works by heating and tightening collagen, it can actually prevent skin aging. Patients who have a treatment at 2-3 year intervals will reduce skin aging and sagging as compared to those who are not treated. Whether you want to prevent future sagging, tighten and smooth your face and neck, or smooth skin on your belly or other body areas, the improved Thermage FLX device can help. 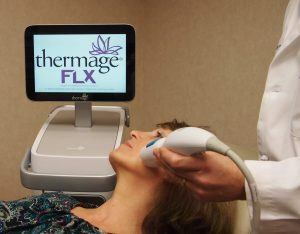 Please book a consultation and ask us about what Thermage FLX can do for your skin. Please call our office at 617 731-1600 to schedule a cosmetic consultation to determine which treatment will be best for you.